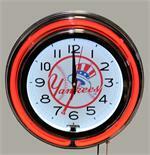 Display your Football spirit with the Red on New York Yankees Wall Clock. This Neon clock has a blue 12.5" outer LED tube and a 9" inner neon tube. The clock has a second sweep in a smooth motion clock. This neon clock is a perfect addition to any room in your house. On/off switch in cord.